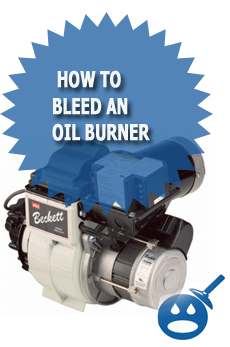 This method of bleeding lines on an oil burner will work for most units including Beckett, Carin and Riello burners. This method is also good for oil fired water heaters, as well as oil fired boilers and furnaces. When you bleed an oil burner you are removing the air from the lines. The oil lines run from the bottom of the oil tank to the burner. So keep that in mid when you are bleeding the lines. It really does not matter what is oil fired, you just need to make sure you get all of the air out. You will need an adjustable crescent wrench or pair of pliers to loosen the oil bleed screw on the pump. 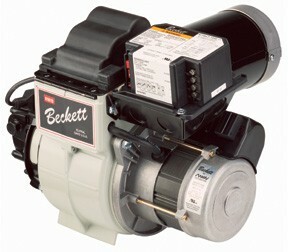 Most Beckett oil burners will come with a Suntec oil feed pump. Some other brands like Reillo and Carlin have different oil feed pumps. You will see the bleed screw towards the front of the pump. Take your pair of pliers or crescent wrench and loosen the bleed screw so that its completely loose. Once you have the bleed screw loose, re tighten it to just hand tight. What you will want to do now is to hit the reset button on the motor so that the motor will turn the pump and create a suction in the oil line. Once the motor starts on the oil burner wait about 2 seconds and then loosen the bleed screw about a half a turn and you will see that a gush of air should spit out followed by a nice stream of fuel oil. If you open the bleed screw and the motor turns of before you get all the air out of the lines you will need to hit the reset button again and repeat the same process until you have a solid stream of fuel. If you hit the motor reset again and the motor does not turn on or you get a “locked out” message you will have to override the lock out command by holding down the reset button for ten seconds and then depressing it to only press it again to get the motor restarted. 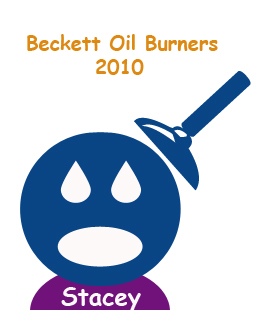 That safety lock out short cut will only work with older and only certain newer oil burners because most of the newer models have timed lock outs that can not be overridden because of safety reasons. Once you have completely removed all of the air out of the lines your oil burner should start right up after you hit the rest bottom for the last time. Thanks for the little reminder on how to do the little things. Too bad you havent explained where the bleed screw is located or what it looks like. I have an old beckett and there are several screws and I cant figure out which is the bleed screw !! The bleed screw has two defining characteristics: a whole through it (like a tube) and a domed shape top. Keep in mind that liquid will flow through it and not out of the hole it is screwed into. Does that make sense? Thanks….I had the same question…too bad you couldn’t post a picture. For any Suntec owners:I found this site very useful for finding where the bleed air flow is. The second link is an example of my pump and where the bleed line is. ETA: This is even better. Hope this helps. 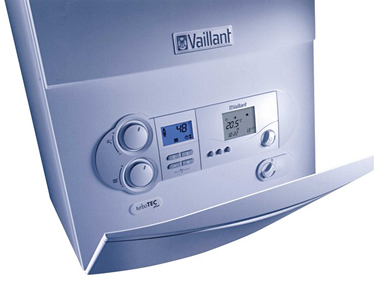 I have a Grant Vortex floor mounted, oil fired, combination boiler. Could you please give me the procedure for bleeding the fuel line after allowing the tank to run dry.Thank you. Thanks a million for this article. I’d been trying to bleed my Firebird Super Q boiler for hours until I read your this and then I done it in about two seconds. put in a synthetic oil to offer enhanced protection and possibly extended oil drains. of dollars each year dealing with oil spills, if contaminated soil was not removed, it can pose a real hazard for generations. My oil burner will not restart automatically when the days are warm and the nights are cold. It appears something is happening during the day when the furnace is not cycling on and off regularly. Sometimes I can restart with a push on the button but sometimes I have to bleed the line once or twice. When the furnace does start I hear a whistling that seems to be coming from the copper tubing. I can hear it inside next to the furnace and outside next to the tank. Is this a problem with the tubing itself? A pinhole, perhaps, allowing air to seep into the line during the day? It’s really getting to be a pain, especially during this time of year.